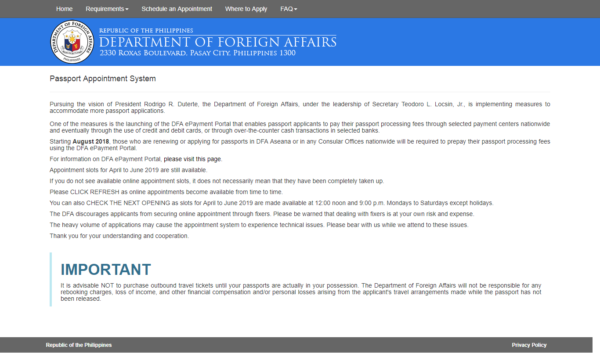 To accommodate and process more passport applications, the Department of Foreign Affairs has launched the online passport appointment system. 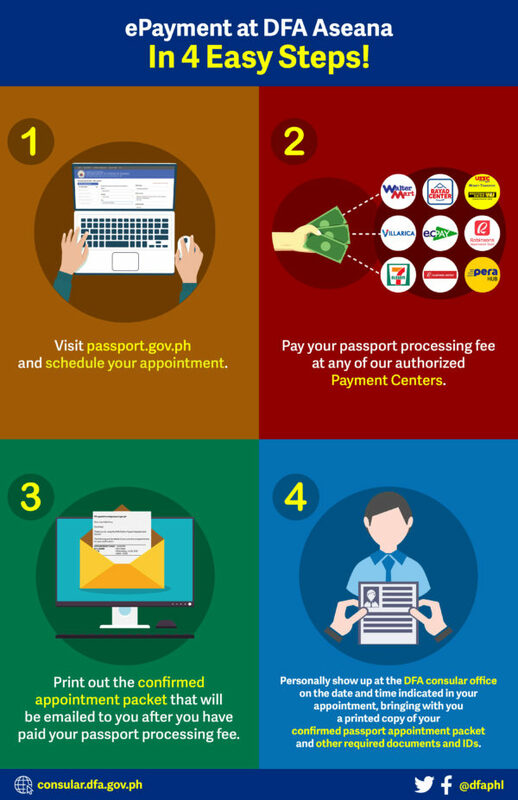 As an enhancement to the said online system, the DFA has launched the ePayment Portal where passport applicants may pay for their passport processing fees through selected payment centers nationwide. Eventually, payment using credit and debit cards will also be available for passport applicants. Meanwhile, those who intend to apply for a passport or to renew their old ones should go to www.passport.gov.ph. To start scheduling an appointment, click on the tab on the upper portion of the webpage. 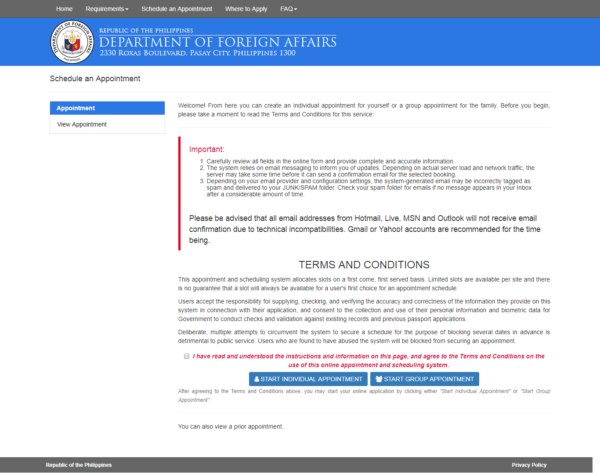 Upon clicking on the button, you will be taken into a Welcome Page where the Terms and Conditions of the system are also seen. Do take note that there is a separate button at the bottom of the page for those who will be scheduling an individual appointment and for those booking for a group appointment. Whether you are scheduling an individual or group appointment, the succeeding pages will require you to fill up an online application form. There are several sections that you need to fill up such preferred site location, date, and time; personal information; family information; application information; and contact information. Note that the availability of schedule will vary depending on the site location you chose. After completing the online forms, you will be asked to choose your preferred passport processing type—whether expedited or regular processing. Afterward, you will receive an email containing a reference number. You will need to present this reference number to your preferred Payment Center before you can pay. After your payment has been successfully processed, you will receive a confirmed appointment packet which will be sent through email. Click the link in the email and print out the contents of that link. You will need to print the following contents and bring it with you during your scheduled appointment—checklist with your indicated schedule; valid Application Form with the bar code, appointment reference number (ARN), and eReceipt number; and two copies of the eReceipt. 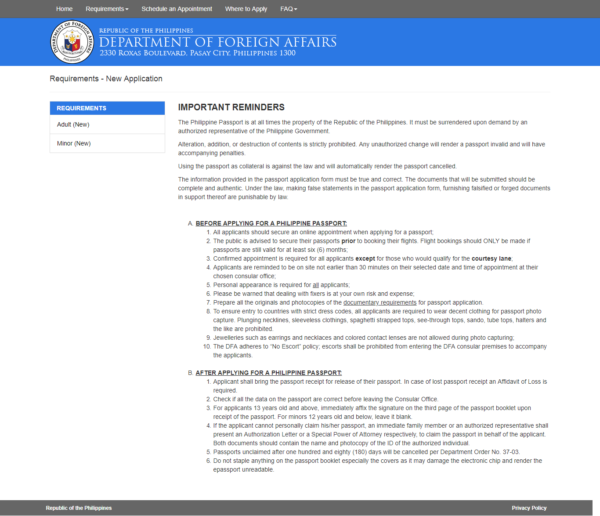 The list of requirements and locations of the DFA regional consular offices, satellite offices located in selected malls, and at the Office of Consular Affairs are also available on the same site. Senior citizens with one travel companion; a person with a disability and a companion; solo parent and his/her minor children; a pregnant woman; minors seven years old and below and his/her parents and minor siblings; and overseas Filipino workers do not need to secure an appointment to process their passports. They may proceed at the Aseana Branch of the Department of Foreign Affairs and avail of the OFW or Courtesy Lane.